Hugo Chávez said farewell tonight. He may show up a few times more, but let’s be honest here: the Hugo Chávez era is over. It could be a month, or six months, or a year, but it would take “a miracle” (his words) to pull out of this one. The good thing about this historic, obviously painful speech is that the uncertainty is over. In praying for a miracle, he basically admitted he is dying, and he has named a successor. He has also said the Constitution should be followed clearly, and that elections will need to take place. He left no wiggle room. He called for unity among his ranks, foreshadowing the obvious infighting that will surely ensue. 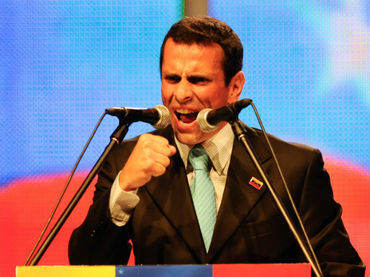 On the opposition side, we can’t fool around: Henrique Capriles (assuming he is re-elected in Miranda this Sunday) is the only presidential candidate we have, the only one who can stand up to Nicolás Maduro. He is the only one with the name recognition to face what we are about to face. There can simply be no room for improvisation here. As Hugo Chávez said himself tonight, “Unidad, unidad, unidad, unidad, unidad…” We have been handed a get-out-jail-card for free – let’s not screw this up. As for Maduro, he is very beatable. He has never been elected into executive position, and people don’t know him very well. He has a series of weak links, and while the emotional aspect of Chávez’s death is a huge wild card, he will struggle to keep chavista forces united and present an appealing face to swing voters. There is a deeper meaning to tonight’s address here, one that will take us a few weeks to process. Suffice to say that life is a fickle beast, and only death is set in stone. A few weeks ago, I said that something dramatic would have to happen in order for us to be electable. Well, something dramatic happened. Game on.